Read what you can do to protect your home. 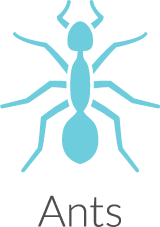 Homeowners can find ants the most difficult pest to deal with. There are many factors that bring ant issues. A few of those factors are moisture, seasons, and food sources. Social creatures, ants typically breed, work, eat and live together underground or under mulch and stacks of wood. Many types of ants enter dwellings and buildings looking for food. Of course, once inside, they have a tendency to become a huge nuisance! Look for a noticeable trail that traces back to a crack, dishwasher, windowsill, etc. Be sure and seal all entry points. If you have an ant problem, call your local expert Alabama Termite & Pest Services today before these pests establish foraging trails into your home or place of business.